The 14 Best Transformations Of 2014! Each year, we pore over thousands of jaw-dropping body transformations. These 14 are some of the year's absolute best. Read the stories and get inspired to change your life today! Read these incredible transformation features, follow the fitness plans of each successful transformer, and begin your own transformation journey today. Each featured story includes that person's full workout, nutrition, and supplement guide, which you can use as a blueprint for your own success. Get started today, and see how far you can go. Troy straight-up completed one of the greatest transformations we've ever seen. At the peak of his heavy days, he tipped the scales at 525 pounds. When we featured him, he'd already cut 315 pounds off his frame! Troy proved that everyone can get fit if they're dedicated, driven, and willing to work. It was a big year for Melody! After she gave birth, she lost weight bouncing along as a cardio bunny, but it wasn't enough to deliver the physique she desired. When Melody dug her mitts into Jamie Eason's LiveFit Trainer, she finally got the results she wanted from fitness. When Brandon no longer needed to get bigger for football, he decided to get smaller for adult life. He cut down 120 pounds by gaining control of his diet, and plans to never return to his former ways. Read his story and follow in his footsteps! At 300 pounds, Dominique's heart could barely handle his workouts, his back and shins hurt, and he was embarrassed. Consistent training changed everything. Dominique lost 140 pounds over three years, cut 30 percent body fat, and decided to compete in physique! Tate was an overweight child who grew into an overweight teen. When he changed his ways, his whole family stood by him and helped in the quest. 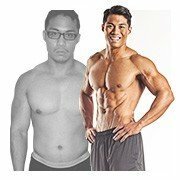 He trained every day and lost 40 pounds! 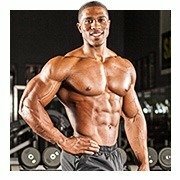 Tate used Bodybuilding.com to get there, and we're proud to be part of his story. Margo initially just wanted to fit into her prom dress, but her first dance with fitness led her to a new way of life. She eventually lost 30 pounds on her own, and now she's chasing her dreams as an NPC competitor. Yalanda had always thought of herself as "heavy," but when she moved to Vegas and had her baby, she weighed nearly 300 pounds. That's when she decided enough was enough. Yolanda stepped out of her personal shadows and cut her weight in half. She gained confidence, and love for herself! Sheryl decided that, if she wanted to make changes in her life, she would have to make them public. Bodybuilding.com gave her the platform to do it. She lost 90 pounds and set a positive example for her young children! After college, Lindsey settled into the easy life. But when she joined the Air National Guard, she was forced to regain her fitness level. Lindsey lost 32 pounds with the help of her husband, and discovered a true passion for training! After leaving the Army, Eric was overweight and prediabetic, and needed to get his body back in order. He found some great coaches and pushed the gas pedal on his fitness ride. Eric lost more than 100 pounds and built the six-pack he desired! Barb had been a fitness competitor back in 1990, but after she had her children and went in and out of marriage, her body reached its heaviest point. After someunfortunate medical news, Barb decided to take control. See how she lost 46 pounds and 22 percent body fat! Pat has killed it over the last three years! He lost 50 pounds in his first 9 months of training, and eventually lost almost 150 total. Since his transformation, he's gotten into professional wrestling and inspired his entire family to follow his fitness footsteps! As Jana put on weight, her colleagues took notice. She no longer felt comfortable in her own skin, and sought to change her physical dynamic. She put herself on a training protocol and got into incredible shape! Jana showed the whole world that it's never too late to change. The human body is capable of great change. Troy lost 220 pounds over a three-year quest to get fit. Once he figured out his problems with food, his life improved significantly. Troy taught us that a transformation isn't just physical; the changes are emotional and mental, too. Nadine Torched Over 30% Body Fat! Nadine silenced her negative self-talk and thrived as she never had before.